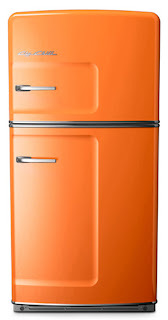 Oh yeah, beautiful retro fridges, powder coated in 50s baby blue, red, vintage green, 70s orange or custom colours...how could you not love these vintage refrigerators from Big Chill? I know I do. Vintage form and high tech function is a winning combination for those with a retro aesthetic. Advertising themselves as "vintage inspired retro appliances" Big Chill's do take you swirling back in time and offer a cool alternative to the standard-line white goods manufacturers. 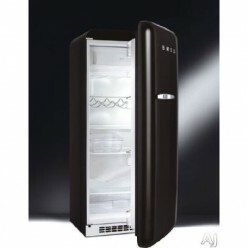 Smeg fridges have the rounded lines, smooth finish and modern functionality so desirable in a retro fridge but again at they are pricey. 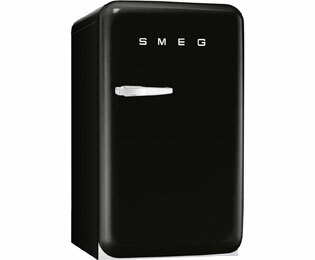 As with Big Chill, the customer pays for that vintage look and feel but the Smeg is is even more expensive. I've seen them from between 2 and 1/2 to 3 and a 1/2 thousand, depending on the model. Smeg is a family owned company that has been round since the 1940's, now run by Roberto Bertazonni, who hired some of Italy's best architects to work for the firm. Bertazonni's vision was to see appliances as something more than mere utilitarian objects - when it comes to form and function, the company believes one should not overpower the other. 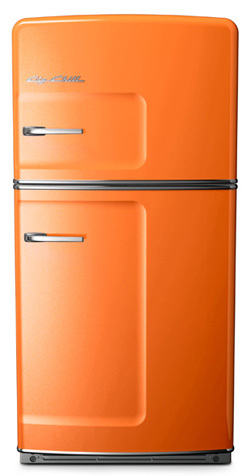 The iconic retro Smeg fridge comes in a variety of colours and is style-wise is hard to flaw - even the handle is a stylistic achievement. 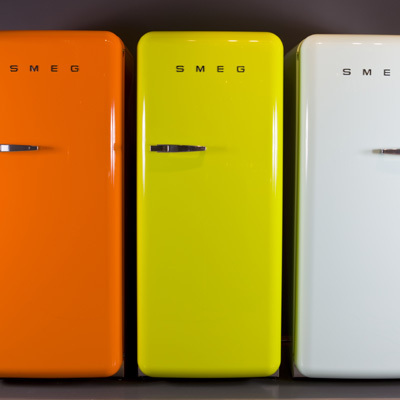 Smeg as a brand has a hip aura and the fridges have popped up in various films and TV shows - they're distinctiveness gives them an edge. 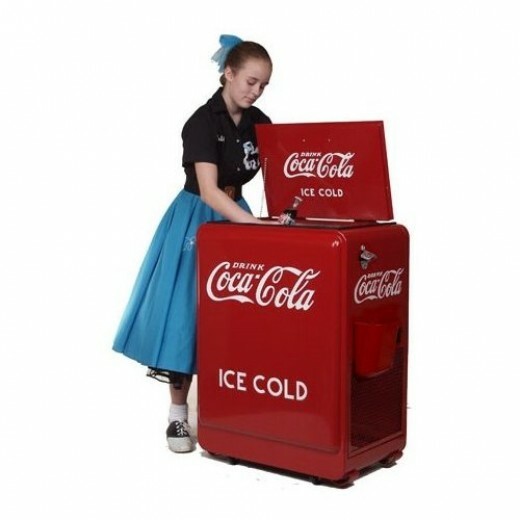 Wobbly versions of refrigerated Coca-cola vending machines first appeared as early as 1928. The customer slid a nickel into the slot and a bottle of coke would roll precariously down the shute.. So ubiquitous was the coke machine they eventually became part of the scenery at almost every gas station and are now everywhere, form university campuses to real estate offices. 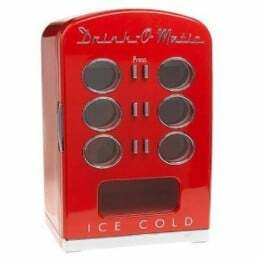 Coke machines were such a feature of many people's childhoods that there's a strong nostalgic feeling toward them, resulting in a booming market in retro designed fridges and vending machine-style coolers for the home. 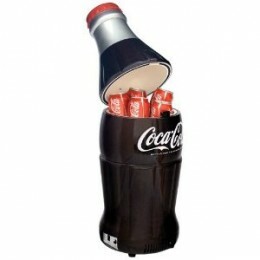 Coke nostalgia is popular in general- anything from bottles, badges, posters, tumblers, yo-yos etc. 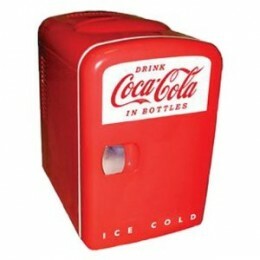 As far as the coke brand name goes, Amazon has a selection of reproduction and novelty coke fridges that tick the right boxes for retro styling..sort of.